Day 19 of the government shutdown: Last night the wooden Dictator Donald Trump (DDT) replaced the angry bombastic one after he conned major networks into televising his speech with no new information. These outlets are the same ones that refused President Obama’s 2014 about executive actions in November 2014 because it would be “political.” NBC also aired a rebuttal to DDT’s false claim of a “crisis” about not having a border wall from House Speaker Nancy Pelosi (D-CA) and Senate Minority Leader Chuck Schumer (D-NY) who emphasized the importance of operating the government. Fact checking DDT’s speech is a waste of space because nothing he said was the truth. And nothing was new—he just followed former talking points and those of VP Mike Pence and Press Secretary Sarah Huckabee Sanders who were sent out on the media trail to reinforce his lies. No GOP members of Congress are putting themselves out front to pass on DDT’s lies. WaPo published a series of DDT’s lies with factual information refuting his entire case for a wall. CBP found six immigrants at U.S.-Mexico ports of entry whose names were on a federal list of known or suspected terrorists. They may or may not have been dangerous. Of the 41 people on the Terrorist Screening Database encountered at the southern border, 35 were U.S. citizens or lawful permanent residents. CBP stopped 91 people on the northern border with Canada who were listed in the database, including 41 who were not American citizens or residents. People are stopped under the existing system, without a wall, and twice as many people are apprehended on a border with no proposed wall. DDT wants people to be very afraid—but just of brown people. All four living presidents denied DDT’s claim that they privately agree with him on building a wall, but Pence said that DDT had received the “impression” that they wanted the wall. Yesterday, Schumer said, “We don’t govern by temper tantrum.” Today DDT stomped out of a negotiations meeting with congressional leaders this morning when House Speaker Nancy Pelosi (D-CA) told him that she wouldn’t fund his wall although the House has passed bills to reopen the government. Earlier DDT had a private lunch with Republicans. 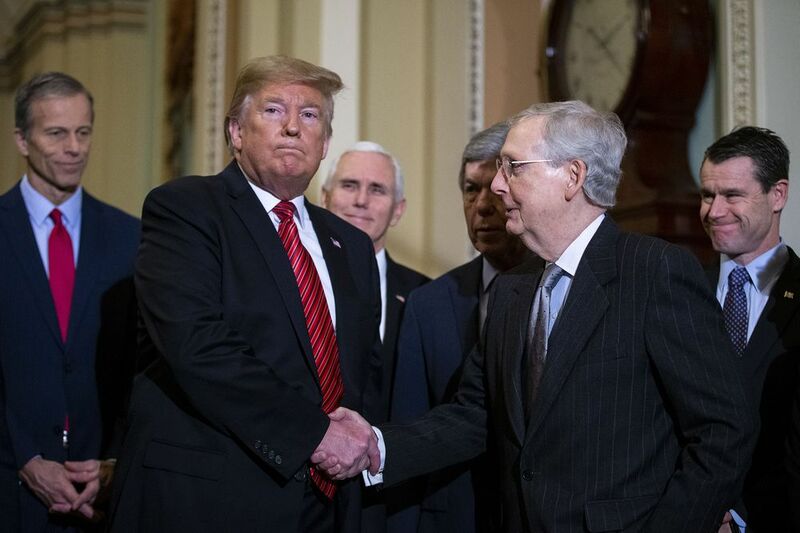 [Right: DDT shakes hands with his employee Senate Majority Leader Mitch McConnell (R-KY) who refuses to address any bill that DDT doesn’t like, destroying the Senate’s independence.] Fifty-one percent of people blame DDT for the shutdown—up from 47 percent just two weeks ago. DDT continues to say that he will declare a “national emergency” only if Congress won’t give him his wall. In essence, there is no emergency—just a strategy because time is not important. For weeks, experts have argued the legality of DDT’s threat. would be legal. Current law has no criteria for this situation, but such action would face lawsuits. the money would come from the military budget. Funding for a national emergency would need to come from the military budget, but the military cannot enforce domestic law without congressional authorization. The statute mandates that construction must be done to support the use of armed forces. The purpose of the wall is the reverse: it’s to employ the military. DDT has also not proved that an emergency exists, and he would face opposition in seizing large areas of private, state, and tribal lands. The Constitution requirement that “No Money shall be drawn from the Treasury, but in Consequence of Appropriations made by Law” was reinforced by the Anti-Deficiency Act (ADA) stating that government employees may not “make or authorize an expenditure or obligation exceeding an amount available in an appropriation or fund for the expenditure or obligation.” Violation of this law results in prison time. Hadrian’s Wall, built across northern England by fearful Romans, was to prevent invasions from barbarians but also failed. The Berlin Wall led to a rapidly growing economy on one side because of progressive ideals and the fall into decline on the other side that resulted in the failure of communism. Like DDT’s highly vaunted wall proposal, the Berlin Wall came from a lie as East Germany claimed the “Anti-fascist Bulwark” protected communists from Western invaders instead of a desire to keep people from defecting to the West. Last Friday, the WaPo pointed out how DDT’s administration failed to understand the consequences until two weeks after its start. After 14 days, senior officials, understanding part of the shutdown’s scope, frantically started their attempt to eradicate the bad optics of making life worse for his supporters. The oil industry still chugs along in the Arctic National Wildlife Refuge, the government allowing pipelines and drilling rigs near wetlands sustaining caribou and threatened birds. BLM is holding public meetings about oil although its staff has been furloughed. EPA staff is processing new permits to drill in coastal waters because federal agencies decide what to do. Farmers filing deadlines for payouts are extended, and checks from the $12 billion buyout after tariffs are still being mailed to wealthy farmers, including members of Congress. IRS tax refunds will be mailed despite this action’s questionable legality. A letter to DDT from the head of the 61,000-member Air Line Pilots Association, International cited danger to the airspace system from fewer safety inspectors, less airline and aircraft manufacturing oversight, increase of recreational drones, and delays to a new communications capability. TSA employees called in by the hundreds with “green flu,” and several of them are quitting their jobs. The EPA and the Interior Department can’t roll back Obama-era regulations and open new water to oil and gas drilling. The response to the opioid crisis has halted. Fishing boats are docked in Alaska. Pharmaceutical companies can’t ask approval for new drugs. One-fifth of the struggling house market is being negatively impacted. People will be evicted from their homes. The FDA has stopped food inspections. No crop reports means that no projections for future agriculture markets. Accidents won’t be investigated for causes and increased safety. A proposed wind farm off the Massachusetts coast can’t have public meetings. The government won’t restrict illegal broadcasts. Health problems can become far more serious. HUD told landlords to use reserve funds to keep from evicting people in low-income housing, but that program expired on January 1. Although DDT may have trouble explaining his failure with shutdown if it’s still in effect in 21 days when he attends the economic summit in Davos (Switzerland), the government is still paying the bills for his trip. Almost two weeks before the event, hotel bills were almost $3 million with DDT’s entourage of eight cabinet members and dozens of officials and aides including his daughter Ivanka and her husband, Jared Kushner. The U.S. taxpayers are still on the hook even if DDT cancels because of strict policies. Over one-half million for renting vehicles and other lodging brings the total to about $3.6 million which doesn’t include the $2.2 million for flying DDT to Davos. Last year’s lodging cost only $1.8 million. 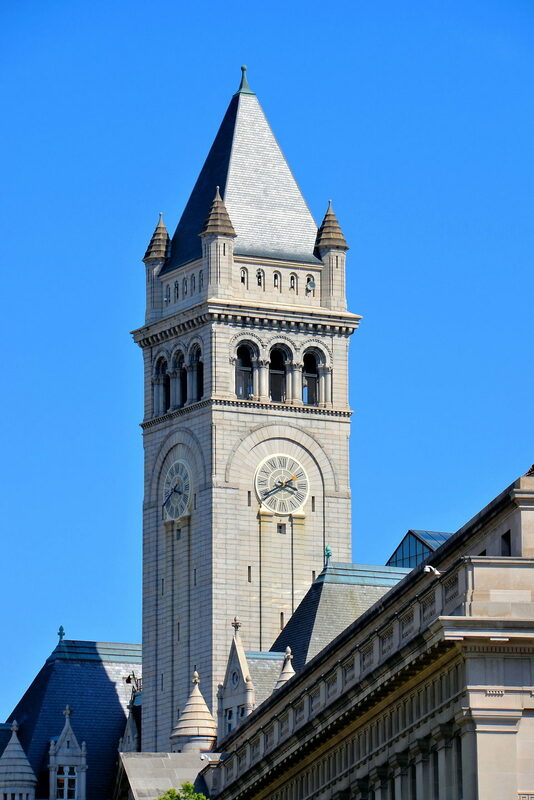 The one bright spot for DDT is that the National Park Service still staffs the clock tower in the “old post office” housing DDT’s Washington hotel.